Plate mark, at lower right corner: "* [DOUBLÉ / [pascal lamb] / J [space] P / 40 [all sideways]". Also, crimp marks on plate which are typical of Southworth and Hawes. Inscribed verso backing, in brown ink, by Millet: "This belongs to / Josiah B. Millet / 88 Garden St. / Cambridge" and in pencil in unknown later hand, a numbered diagram of participants around the operating table, from left to right clockwise: "1. J. Mason Warren / 2. Henry G. Clarke / 3. [illeg.] / [4.] [illeg.] / [5.] Freeman J. Bumstead / 6. [illeg.] Townsend / 7. John C. Warren / 8. Chas. H. Hildreth." All retraced in ink by J. Millet.The diagram in pencil and surrounding notations are mostly illegible. Beaumont Newhall via Richard B. Holman describes the image as follows: "left foreground, John Mason Warren, M.D. ; extreme left, George Hayward, M.D. ; with left-arm akimbo, Solomon D. Townsend, M.D. ; with hands on patient's thigh, John Collins Warren, M.D. ; at extreme right, James Johnson, M.D. The figure administering ether is not Dr. Morton, but a stand-in. The patient is also a substitute." Note: inscriptions may or may not be by Millet, however, will stand until these can be further researched. The setting for this daguerreotype is the teaching amphitheater of Boston's Massachusetts General Hospital. Dr. John Collins Warren, cofounder of the hospital and professor of anatomy, stands with his hands upon the patient's thigh, explaining the proceedings to a student audience seated out of camera range. Dr. Solomon Davis Townsend, who performed the operation, stands behind Warren with his left arm akimbo. An unidentified anesthetist holds a sponge soaked in ether near the head of the patient who, curiously enough, still wears his socks. 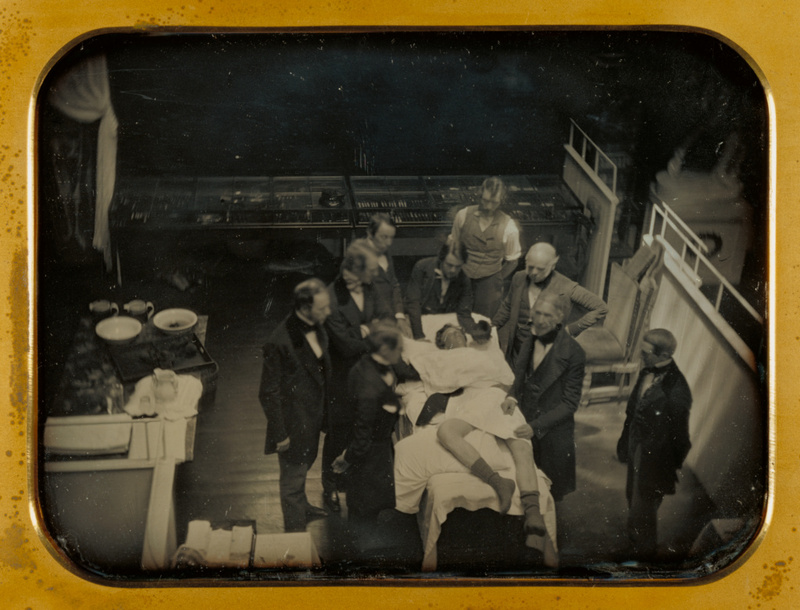 Warren had commissioned Albert Sands Southworth and Josiah Johnson Hawes to make the first photographic record of an actual live medical operation, which was also the retiring Dr. Warren's last lecture. The doctors' heads all moved during the long exposure, causing blurring and confirming the photograph's candid circumstances. Arnold Crane, American, 1932 - 2014, sold to the J. Paul Getty Museum, 1984. Lowry, Bates, and Isabael Barrett Lowry. The Silver Canvas : Daguerreotype Masterpieces from the J. Paul Getty Museum, exh. cat. (Los Angeles: J. Paul Getty Museum, 1998), p. 183, pl. 68. Masterpieces of the J. Paul Getty Museum: Photographs (Los Angeles: J. Paul Getty Museum, 1999), p. 47.